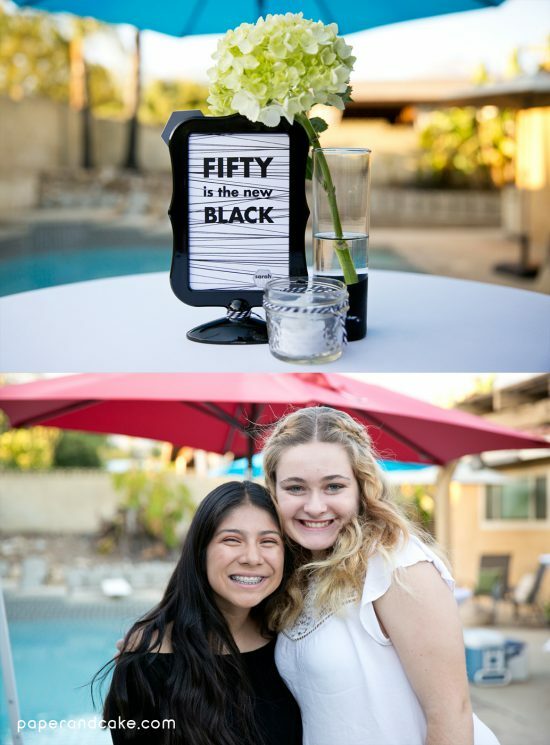 This stunning black and white birthday party all started with that cool piece of vintage furniture – that I found in the alley behind my house. I’m not usually a dumpster diver per se, but this one just screamed my name! After a thorough cleaning, some reconfiguring, and a couple of coats of chalky finish paint (not chalkboard paint! ), it was ready. 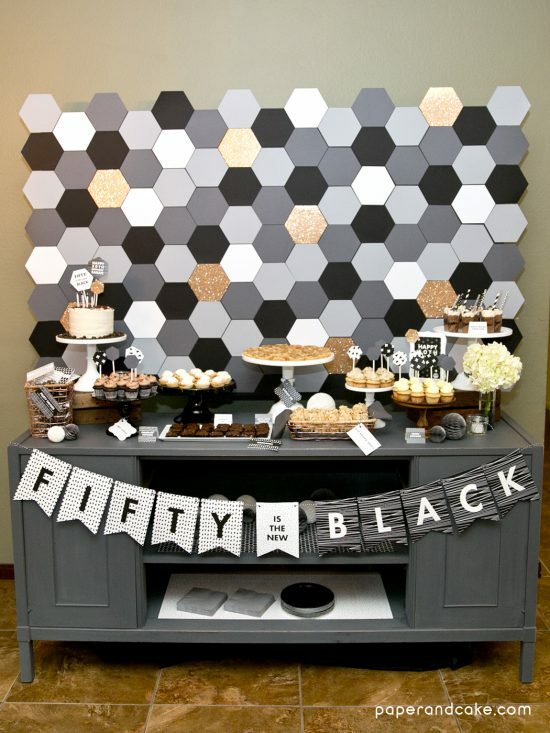 I purchased a couple of extra large pieces of black foam core and “tiled” on hexagon shaped pieces of scrapbooking paper, cut out with the help of my Cricut machine. 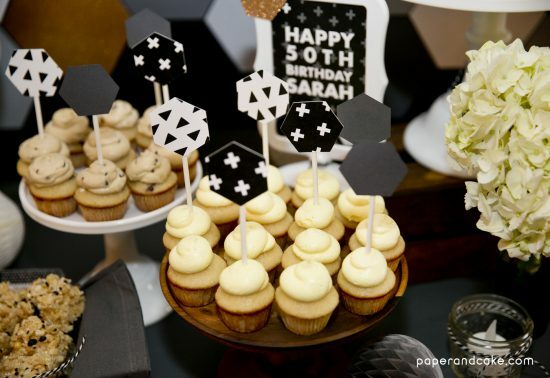 The hexagon shape, along with innumerous black and white patterns, were the basis for the graphics in this set of party decorations. 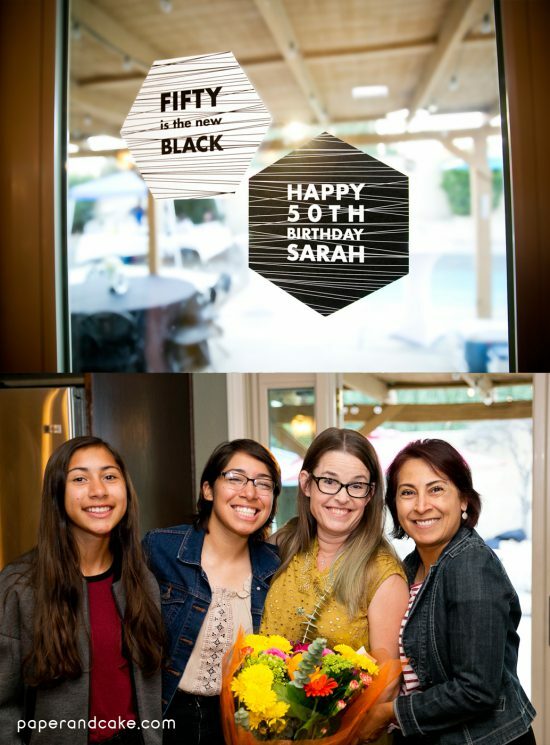 From door signage to cupcake toppers they all worked together and looked so elegant! 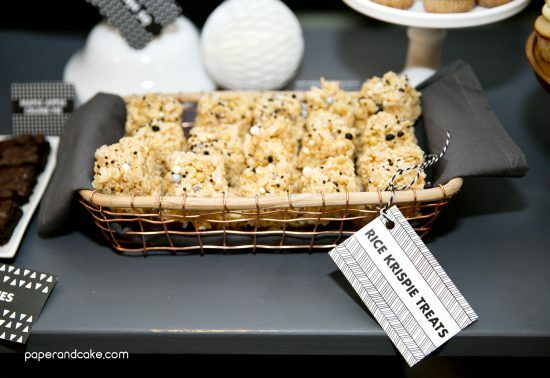 See more of our grown-up themed parties, including this gorgeous Succulent themed Party! 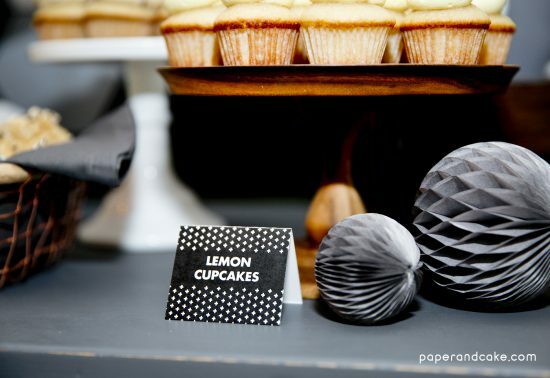 I was also excited to have found these tissue paper honeycomb balls at Ikea, in all the right colors… gray and white! 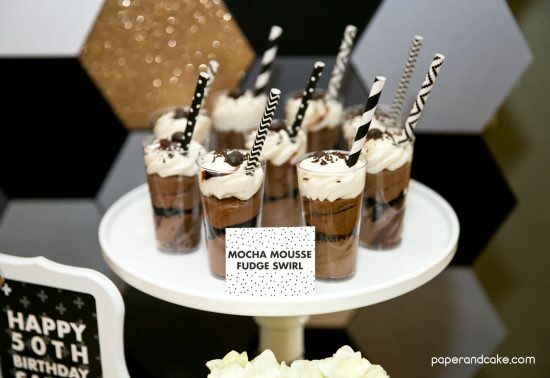 They added just the right touch, nestled in with the desserts and the table centerpieces. While we ordered the majority of the sweets (thanks Kristin! ), the cake was 100% homemade. 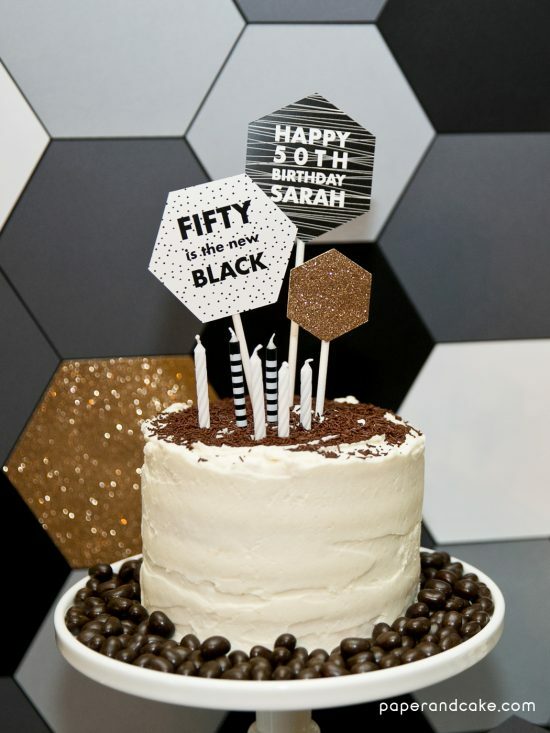 In the birthday girl’s favorite flavor – chocolate – this cake was topped with chocolate sprinkles and served on a bed of chocolate coffee flavored jelly beans. And that topper? 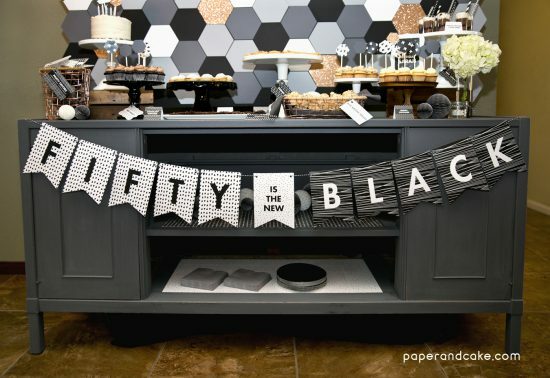 Easy, cute, memorable and printable – all included in this printable kit of decorations. When guests left the party (and definitely during the party!) 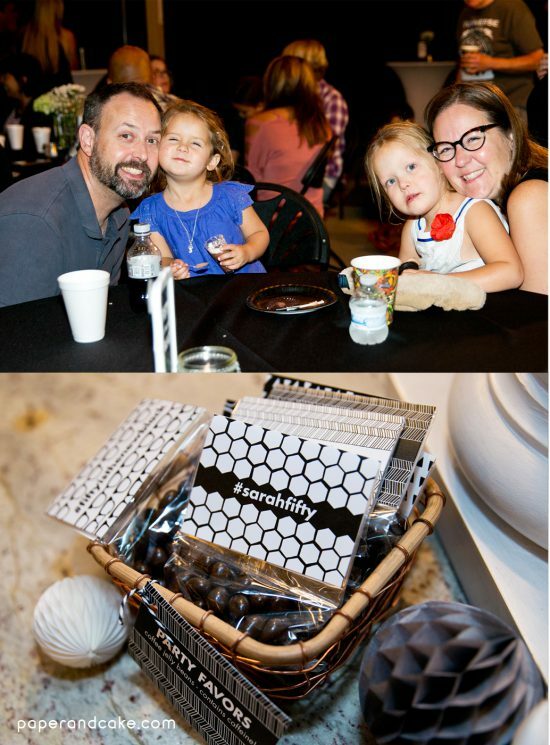 they were offered more of the coffee jelly beans packaged in a matching set of party favor bags. I just love a good theme don’t you? 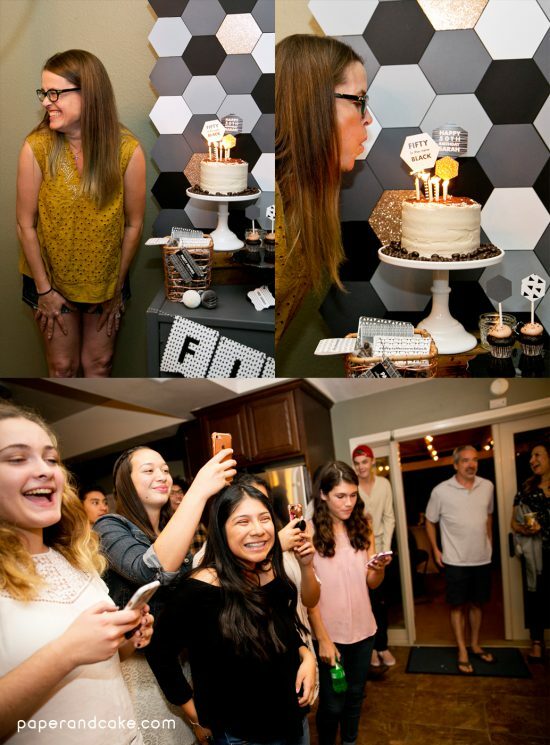 A great time was had by all the guests at my sister’s party… and a HUGE Happy Birthday to you Sarah! So, here’s the deal. 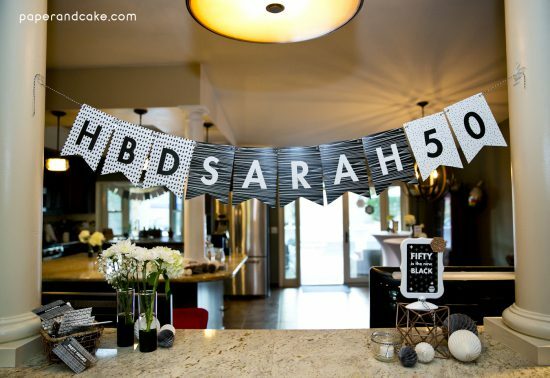 We’ve got ALL of these black and white birthday party decorations right here for you – it is a printable pdf kit that couldn’t be easier or more fun to assemble! So many of the items in the set are personalizable, by you, using only acrobat reader (free from adobe.com) – you can change the text to read anything you wish. Grab your set and get started today! *Paper & Cake is a participant in the Amazon Services LLC Associates Program, an affiliate advertising program designed to provide a means for sites to earn advertising fees by advertising and linking to amazon.com.